Industrial style isn’t new to Brimfield. In fact it has been around for quite a while. It was there before it became as popular as it is now and it’s not going away anytime soon. There has certainly been an increase in industrial dealers over the past decade and while it used to be more concentrated in some particular fields, that is no longer the case. 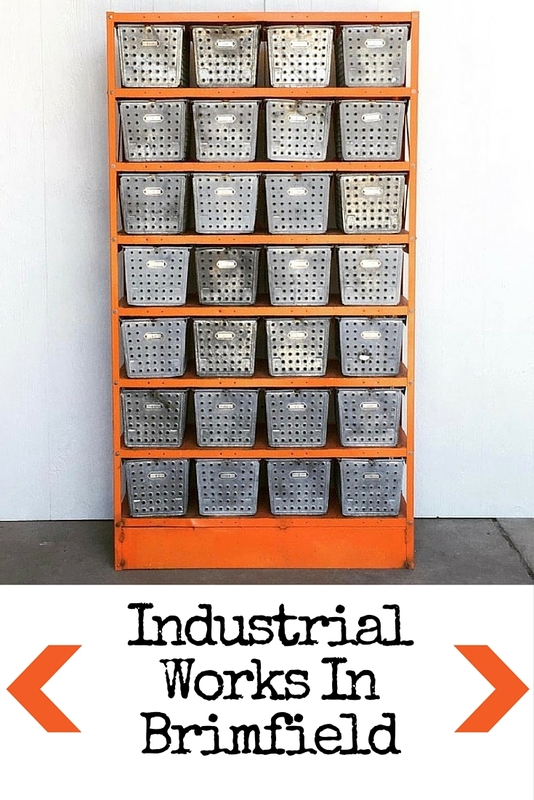 We have some amazing industrial dealers on just about every field. Eric, has become a good friend of ours and we are continually impressed by the quality and quantity of his goods and his prices can’t be beat. You never know what you will find but you won’t be disappointed. Located right on Route 20 at Shelton’s. Scrapped and Found is located directly behind Rustored Salvage and it’s another booth you don’t want to miss. Dave makes a lot of pieces himself out of salvaged materials and always has a very cool set up with lots of industrial pieces. At the last show he had large quantities of ladders and printer’s trays which were very popular. Another must-see booth at Shelton’s. We always say that we work the nicest dealers in Brimfield, and Amy at Anchored Salvage is proof of that. Amazing pieces, a great eye, a talent for repurposing and a positive attitude! Located at the front of Sturtevant’s right on Route 20. Barge Canal has been with us since the beginning and we love them for it. Their booth in Brimfield is always impeccably styled and busts the myth that curated booths have higher prices. So don’t be fooled! Jeremy and Adelle also operate a vintage store in Burlington, VT that focuses on 20th century design and american industrial that we are dying to visit! Don’t miss them on The Meadows. Beth and Kathy, the sisters behind the industrial furniture pieces and artifacts in the Silver Hippopotamus booth are true artists. Located at Mohogany Ridge, they are delightful to talk to and their love of Brimfield and their one of a kind pieces is contagious. I’m always excited to see what they are going to bring to the next show! Craig is Farnswood and Farnswood is industrial. It doesn’t get more industrial than his custom welded marquis letters, repurposed furniture and lighting. He always has a great mix of large pieces and smalls and has been at Quaker Acres for the past few shows. Aged ObjectsDan at Aged Objects specializes in industrial finds and antique hardware. Find him at New England Motel. There is no comprehensive directory of dealers at the show, so search for “industrial” in the Brimfield Smartphone app to help you find the location of these dealers and many others who specialize (or dabble in) industrial pieces. We are adding new dealers all the time!